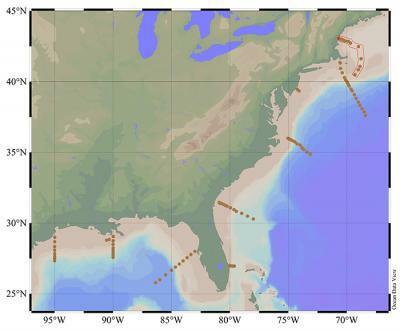 A continental-scale chemical survey in the waters of the eastern U.S. and Gulf of Mexico is helping researchers determine how distinct bodies of water will resist changes in acidity. The study, which measures varying levels of carbon dioxide (CO2) and other forms of carbon in the ocean, was conducted by scientists from 11 institutions across the U.S. and was published in the journal Limnology and Oceanography. Coastal ocean acidification, Wang says, can occur when excess carbon dioxide is absorbed by, flushed into or generated in coastal waters, setting off a chain of chemical reactions that lowers the water's pH, making it more acidic. The process disproportionately affects species like oysters, snails, pteropods, and coral, since those organisms cannot effectively form shells in a more acidic environment. According to the survey, says Wang, different regions of coastal ocean will respond to an influx of CO2 in different ways. "If you put the same amount of CO2 into both the Gulf of Maine and the Gulf of Mexico right now, the ecosystem in the Gulf of Maine would probably feel the effects more dramatically," he says. "Acidity is already relatively high in that region, and the saturation of calcium carbonate—the mineral that many organisms need to make shells—is particularly low. It's not a great situation." Excess CO2 can enter coastal waters from a variety of different sources, Wang says. One large source is carbon dioxide in the atmosphere, which has been steadily increasing in concentration worldwide for the past hundred and fifty years. The higher those levels of atmospheric CO2 rise, more CO2 gas will be absorbed into seawater by contact, says Wang. Another potential culprit, he notes, is nutrient-rich runoff from land. Rainfall and other surface flows can wash fertilizers and other byproducts of human activities into river systems and ground water, and ultimately, into the coastal ocean, delivering an excess of nutrients and often an explosion of biological activity that can lead to decreased oxygen and increased CO2 and acidity. "This happens regularly in the Gulf of Mexico," says Wang. "The Mississippi River dumps enormous amounts of nitrogen and other nutrients into the Gulf, which spawns large algal blooms that lead to production of large amount of organic matter. In the process of decomposing the organic matter, the microbes consume oxygen in the water and leave carbon dioxide behind, making the water more acidic. If this process happens in the Gulf of Maine, the ecosystem there may be even more vulnerable since the Gulf of Maine is a semi-enclosed system and it may take longer time for low pH, low oxygen water to disperse." Zhaohui Wang, Woods Hole Oceanographic Institution, and his colleagues sampled the waters off the US East Coast about the R/V Ron Brown. Starting in the waters off Galveston, Texas, they worked their way around the Louisiana and west Florida coasts, past the Florida Straight, and up the eastern seaboard, collecting samples along nine different transects that ran from the coast to deep ocean off the shelf break, up to 480km (300 miles) offshore. Wang and his colleagues conducted their fieldwork in 2007 aboard the R/V Ronald H. Brown. Starting in the waters off Galveston, Texas, they worked their way around the Louisiana and west Florida coasts, past the Florida Straight, and up the eastern seaboard, collecting samples along nine different transects that ran from the coast to deep ocean off the shelf break, up to 480km (300 miles) offshore. During the cruise, the researchers measured seawater samples for total dissolved inorganic carbon (DIC), which is made up of a combination of carbonate, bicarbonate, dissolved CO2 and carbonic acid. The team compared this measurement to the water's total alkalinity, a measure of how much base is in a water sample. The ratio of the two is a marker for water's ability to "buffer" or resist changes in acidity. Waters with a high ratio of alkalinity to DIC, Wang says, would be less susceptible to acidification than waters that showed a much lower ratio. After analyzing their data, Wang and colleagues found that, despite a "dead zone" of low oxygen and high acidity outside the mouth of the Mississippi, the Gulf of Mexico on the whole showed a high ratio of alkalinity to DIC, meaning it would be more resistant to acidification. As the team traveled farther north, however, they saw the ratio steadily decreases north of Georgia. The waters in the Gulf of Maine, Wang says, on average had the lowest alkalinity to DIC ratio of any region along the eastern seaboard, meaning that it would be especially vulnerable to acidification should CO2 levels rise in those waters. While it's unclear exactly why the ratio of alkalinity to DIC is low in those northern waters, Wang thinks part of the issue may be linked to alkalinity sources to the region. For example, the Labrador Coastal Current brings relatively fresh, low alkalinity water down from the Labrador Sea to the Gulf of Maine and Middle Atlantic Bight. If this current is the major source of alkalinity to the region, he says, it may mean that the Gulf of Maine's fate could be linked to changes in global climate that, through melting sea ice and glaciers, increase the flow of fresh water to the Gulf of Maine. However, whether this freshening is accompanied by a decreases in seawater alkalinity and "buffer" capacity remains unknown. Since the waters of the northeast U.S. are already susceptible to rising acidity, Wang says this raises big questions about how species of marine life—many of which are important to the commercial fishing and shellfish industry there—will fare in the future. "For example, how are oysters going to do? What about other shellfish? If the food chain changes, how are fish going to be impacted?" Wang asks. "There's a whole range of ecological and sociological questions." There is a great need for need for more robust coastal ocean chemistry monitoring and coastal ocean acidification studies, he adds. A better understanding of the changing chemistry will help fisheries regulators to better manage the stocks.